The hook shot came into being over half a century ago with George Mikan and the Minneapolis Lakers. This shot is used mainly by post players close to the basket, near the blocks or in the paint. The post player receives the ball inside with his/her back to the basket. The original "classic" hook shot is started by pivoting sideways on the non-shooting foot (the left foot with a right-handed shot) with the foot remaining on the floor. The body is turned sideways to the hoop with the off-shoulder pointing toward the hoop. Keep your body between the ball and the defender. The ball rests on the shooting hand, while the non-shooting hand is on top of the ball initially (before the actual shot). The shooting arm's elbow is "locked" into position next to the body and the shooting arm is extended away from the hoop and the defender on about a 45-degree angle. This is a one-handed shot. The shooter must turn his neck and head to look at the target. The shooting motion is begun by a lifting of the shooting arm up and over, or "from ear to ear". Like any good shot, the ball is released from the fingertips with a snap of the wrist. The off-arm can be held up to ward off the defender, but you cannot push or "hook" the defender with that arm. After releasing the shot, the shooter should immediately become a rebounder, pursue any missed shot and power it back up to the hoop. See this old footage of a feed into the post and a classic hook shot, courtesy of YouTube. Like most things, the hook shot has evolved over the years. Kareem Abdul Jabbar of the Los Angeles Lakers turned it into the unstoppable "sky hook" in the '80's. The 7-footer would catch the ball, and pivot on the non-shooting foot, but instead of keeping the foot on the floor, would jump off the floor while extending the shooting arm high. About the only way defenses could stop this would be to deny Kareem the ball, double-team so that he couldn't get into the motion of the shot, foul him, or just hope that he would miss one occasionally. Footwork is very important in correctly and consistently executing the sky-hook. When making the move to the middle, the inside foot (left foot for right handed shooters) must be planted parallel to the baseline. If the foot is over-rotated and is planted more than parallel (i.e. pointed towards the baseline), this will cause the shoulders to over-rotate, exposing the shot for a block. If the foot is under-rotated and planted pointing towards 1/2 court, this will not allow for proper balance. The same principles apply for a sky hook to the baseline side. If the post player is on the side of the lane and turns to the baseline to execute the sky hook, the foot must now be perpendicular to the baseline. The same rules apply as above .. if your foot is pointing more towards the lane, you are exposing the shot. If it is pointing toward the corner, you lose balance. See this video of Kareem and his devastating "sky-hook", courtesy of YouTube. The modern-day jump hook merges the techniques of the old classic hook shot with the jump shot. The ball is received usually with the back to the basket. The shooter pivots and the body is turned sideways (perpendicular) to the basket with the shoulders in a line toward the hoop. The shooter jumps up off both feet much like a jump shot. Instead of extending the shooting arm outward and away from the hoop (as in the classic hook shot), the shooting arm extends vertically and high with the ball above the shoulder. The head is turned so that the shooter can see the target. The ball is released from the fingertips with a snap of the wrist, much like a jump shot. Learn to shoot the jump hook with either hand. 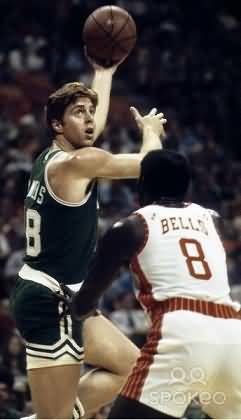 The jump hook is an important weapon that any great post player ought to include in his arsenal. A good low post player can keep the defender guessing by mixing up the jump hook with the baseline drop-step move, the up-and-under move and the turn and shoot move. See Post Moves. See this video of the jump hook. Hal Wissel has five excellent shooting DVD's that will take players and coaches to the next level. The second of these DVD's "BASKETBALL SHOOTING - Off the Pass, Off the Dribble and In the Post" does an excellent job of teaching the hook shot, and various post moves. with Tony Bergeron, East Longmeadow (MA) High School Head Coach; Five-Star Basketball Instructor.